To protect your search privacy, you may wish to Turn off display of recent searches. These are the same entries which appear in the drop-down, when you search through the explorer. Windows Explorer shows suggestion pop-ups as users type into the Search Box. These suggestions are based on their past entries into the Search Box. To do so, type gpedit.msc in start search and hit enter. This will open the Group Policy Editor. In LHS pane, click User Configuration > Administrative Templates > Windows Components > Windows Explorer. 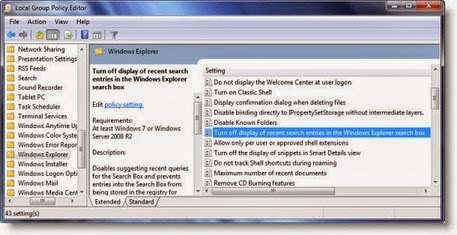 In RHS double click on Turn off display of recent search entries in the Windows Explorer. In the window that opens, change the setting to Enabled. Click Apply > OK. This setting disables suggesting recent queries for the Search Box and prevents entries into the Search Box from being stored in the registry for future references. If you enable this policy, Windows Explorer will not show suggestion pop-ups as users type into the Search Box, and it will not store Search Box entries into the registry for future references. If the user types a property, values that match this property will be shown but no data will be saved in the registry or re-shown on subsequent uses of the search box.